Water, in itself, is the fountain of youth. Water refreshes, cleanses, purifies, and gives us pleasure. We use water for drinking, cleaning, bathing, irrigating, recreation and swimming. For all of these uses, we expect clean water. Is all water clean? Is rain clean? Is lake water clean? Is river water clean? Is city water clean? In nature, water is ‘cleaned’ or purified through the stages of the water cycle. Water falls from the sky as rain, sleet, hail and snow and lands on built or natural surfaces. Precipitation flows down mountains, hills, and valleys into rivers, lakes and wetlands through a series of rock and sand layers that filter and purify water. Moving downward it collects impurities, then is absorbed or evaporates back into the air. Ground absorption filters water into underground reservoirs or aquifers. In contrast to nature, cities purify water in water treatment plants. Treatment plants send contaminated water through five steps: screening, coagulation and settling, filtration, disinfection and aeration. Screening removes large branches, fish and plants. Dirty water is mixed with lime, aluminum sulfate (alum) and chlorine to attract impurities and kill germs. Next, a sedimentation basin removes globs which sink to the bottom. Next, water filters through sand and gravel. Like nature, filtering removes particles. Chlorine and other chemicals kill any germs and extend clean water life. Aeration removes final contaminants. Water is ready for you! Clean water is healthy water. Clean water is water that people, animals, insects and plants can drink and stay healthy. This is potable water. Safe water, on the other hand is non-potable and is used for watering and washing. It should not be used for drinking. 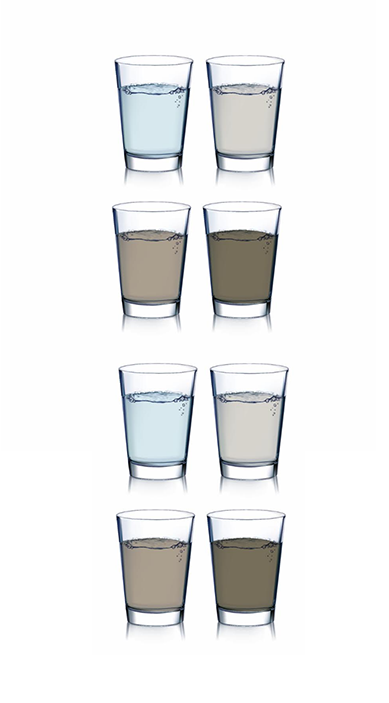 Water tests include tests for up to 90 contaminants. Testing is done for E.Coli bacteria, lead, pesticides, chlorine, hardness, pH, nitrates and nitrites. Water cleanliness measures turbidity, temperature, alkalinity and oxygen. Turbidity is a measure of water clearness (not color); turbid water is water with suspended matter (clay, silt, organic, inorganic materials and microscopic organisms). Erosion, runoff, algal blooms and sediment disturbances cause turbidity. Alkalinity is the pH measure of acidic or basic quality of water; pH0 is very acidic, pH7 is neutral and pH14 is very basic; most aquatic animals thrive in a pH range of 6.5-8.0. Alkalinity is affected by wastewater discharges, drainage, acid rain, temperature and porous or non porous rock. Dissolved Oxygen is the measure of oxygen gas molecules in water; high levels support healthy and stable environments with diverse aquatic life. Cold temperatures hold more oxygen than warm. Aquatic plants and animals are affected by temperature changes. Warm water discharge, lack of shaded banks, and run off cause temperature changes that affect aquatic populations. Everything living needs access to clean water! 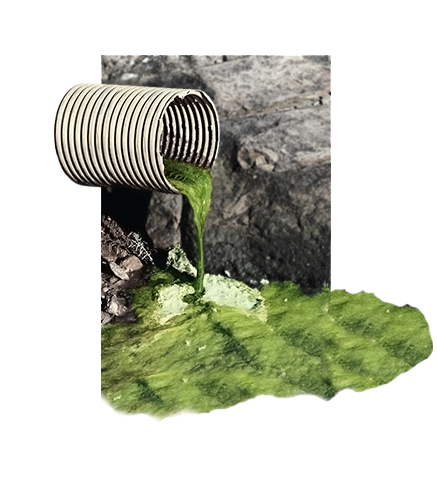 Chemicals, toxic substances, microorganisms, wastes, and wastewater in water sources pollute, or contaminate water. In watersheds, pollutants affect populations all the way to the lowest body of water. If water acidity is too high, corrosion can leach lead from plumbing. When animal, human or fertilizer wastes leach into the water cycle, nitrates and nitrites grow. Lead and nitrates are serious contaminants that affect life. Development along transportation systems and adjacent to rivers and lakes removes natural filtering grounds. In addition, industry and urbanism produce toxic wastes - liquids, oils, gasses, sludge and debris that seep into the air, groundwater, and soil. Nature’s water filtration is jeopardized by waste dumped directly into waterways. Take a walk to the nearest river, stream or pond. Do you see water pollution? Check your community’s water report to find out if your water has harmful levels of E.Coli bacteria, lead, pesticides, chlorine, hardness, pH, and nitrates and nitrites! After the first Earth Day in 1970, the United States Environmental Protection Agency (EPA) and the Clean Air, Clean Water, and Endangered Species Acts were created. The Federal Water Pollution Control Act, commonly known as the Clean Water Act, followed. It seeks to “restore and maintain the chemical, physical, and biological integrity of the nation’s water. Check the EPA’s Water Pollutants and Control. Make an outline of what you know about clean water. Make a Venn Diagram to describe nature’s and people’s ways of cleaning water. Write a paper about the current condition of your community’s water. Imagine ways to improve it. 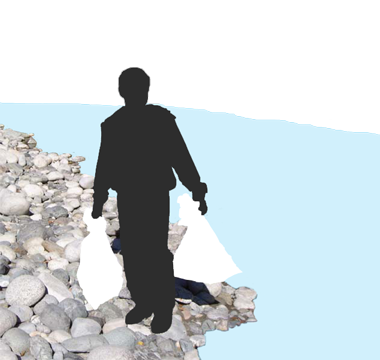 Find local water or river clean up days. Better yet, organize a river clean up day! Get involved and help keep your water clean! Be a clean water activist! 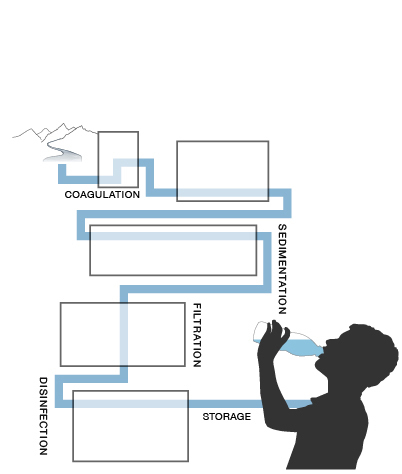 Activity 4 – How does water get to your house? When we are thirsty, all we have to do is go to the sink and turn on the tap. Water runs clear and clean. Where does this water come from? It travels a long journey that starts with collection from a fresh water resource such as a lake, a river, or an underground aquifer. The water then is carried through underground pipes to a water purification plant. This original water is filtered through screens to capture debris. Once free of debris, it moves through the chemical application process where lime, aluminum sulfate (alum) and chlorine to attract impurities and kill germs are added. It then moves on into mixing basins and begins a flocculation process in which larger heavier particles or sediment are separated. Then the water is moved through a series of sand and gravel filtration basins similar to nature’s filtration system. Finally additional chemicals are added to correct any problems and then the water is dispersed to a distribution center and then to your house. Chart these steps necessary to bring fresh water service to your home. Foam in water can be natural or the result of excessive nitrates in the water. Aeration means to increase the amount of oxygen in the water. PH balance of 7 is considered neutral, though this may be affected by water temperature. Zero Mass Water from sunshine & air!